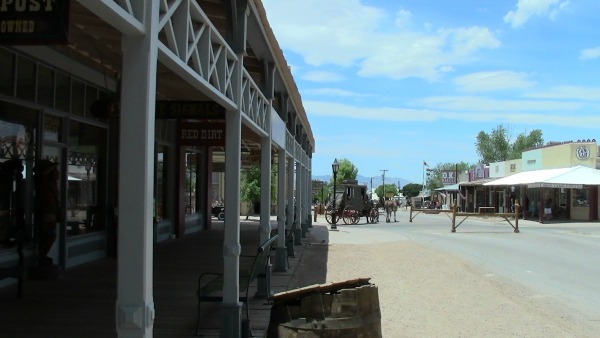 Experience unforgettable Tombstone Arizona attractions! Take a trip back in time to the real Old West. Both kids and adults will be fascinated with these one of a kind Tombstone attractions… and both day and night! From the must see orientation for visitors known as Tombstone’s Historama which will familiarize you with the history of this well known town, narrated by the late actor Vincent Price to the Bird Cage Theatre family ghost tours, O.K. Corral famous gunfight site, historic main street with its unique shops and saloon, Sister Paranormal Investigators, and plenty of locals who make the experience so, well, “lifelike,” you will feel like you went back in time to the 1880’s. 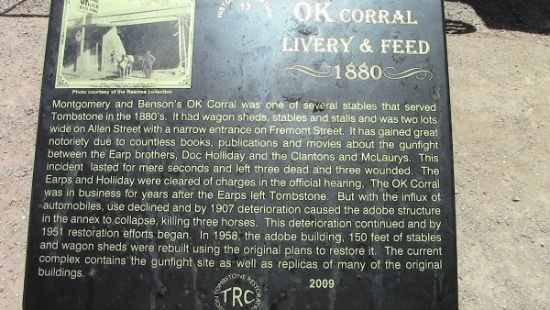 Having visited myself, I can tell you this town has so much history and actual visible signs of times gone by… things like bullet holes that still exist inside the old Tombstone morgue. When I toured the old morgue myself, we were told that the old jail was located right behind the jail where shootouts were not uncommon. Our guide showed us a couple of holes where bullets had hit one of the windows. We were also taken downstairs where the fluids from the dead bodies were drained down into as well as shown the drain itself where the mortician bled the bodies… It was actually quite interesting as our tour guide explained all the interesting historical facts. You can take the daytime tour of the old morgue as we did or you can take one of their nighttime tours at 6:00, 8:00 and 10:00 pm where you will be sure to experience some of the haunting that are known to be quite active! If you are brave enough, they also take reservations for midnight tours and even overnight investigations. 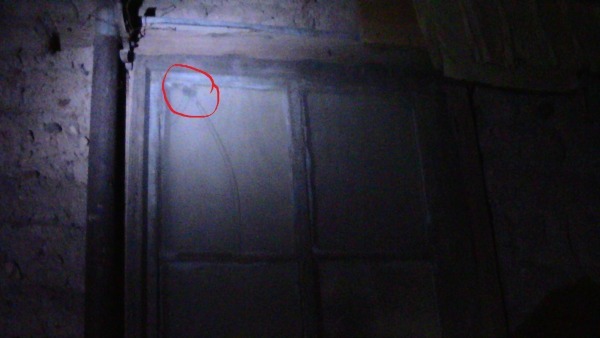 If you like ghost tours, consider taking one of the family ghost tours as well. These tours are designed for families with children at least 12 years of age at 6:30 pm. 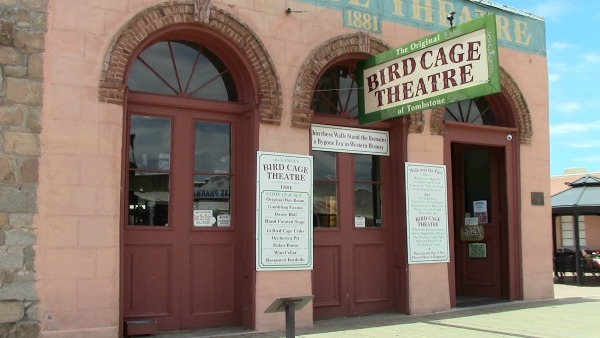 The Bird Cage Theatre suggests that you purchase your tickets by 5:30 pm. They also offer adult ghost tours at 8:00 pm, 9:30 pm and 11:00 pm. Known as the number one most haunted building in America (TAPS), Epicenter of the Paranormal (Travel Channel) and Ground Zero for the Paranormal (History Channel) this is one historic tour you will not want to miss. The O.K. Corral is another one of those attractions in Tombstone that may be of interest to you… this really is the Wild, Wild West! Witness the dramatic events that made what the town is today! Watch a reenactment of the famous Gunfight at the O.K. Corral and stand exactly where this gun battle took place. Be sure to see the “Live” Gunfight Show taking place every day at 2 p.m.
Another big attraction is Tombstone’s Historama show. Every 30 minutes a show starts so you will not have to wait long to catch the next one. Get an inside glimpse of history such as the silver boom, O.K. Corral Gunfight, the great fire and learn about the legendary Geronimo’s Apache Indians leading up to today. This is a 25-minute multimedia history narrated by none other than Vincent Price. Shows are every 30 minutes, beginning at 9:30 am until 4:30 pm. 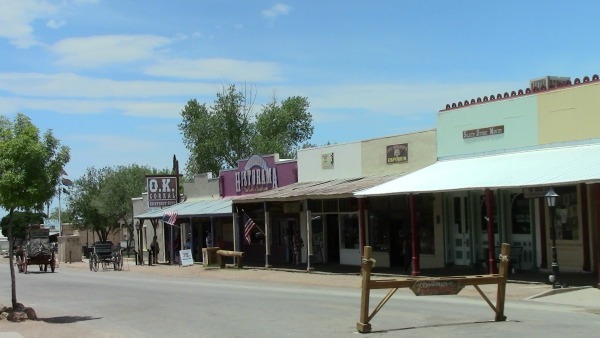 There are also plenty of little shops you can stop into such as the Tombstone Epitaph, Old West’s most famous newspaper. Best yet, admission is free as the majority of these attractions. It’s perfect as far as the length of the street. It really isn’t too long if you or someone has physical challenges, the street is flat and easy to get around. If you need a bite to eat, they have plenty of places to grab a tasty snack or even a beverage of your choosing. Tombstone Arizona attractions are many as you can see… Oh, you can also take a ride on an old buggy, pulled by horses, of course! I REALLY enjoyed stopping in and exploring this historic town. It may not be a very big town but don’t let that fool you. There’s plenty to see and do and with many of the people dressed up the way they did back then, it just seems that much more real. Enjoy!